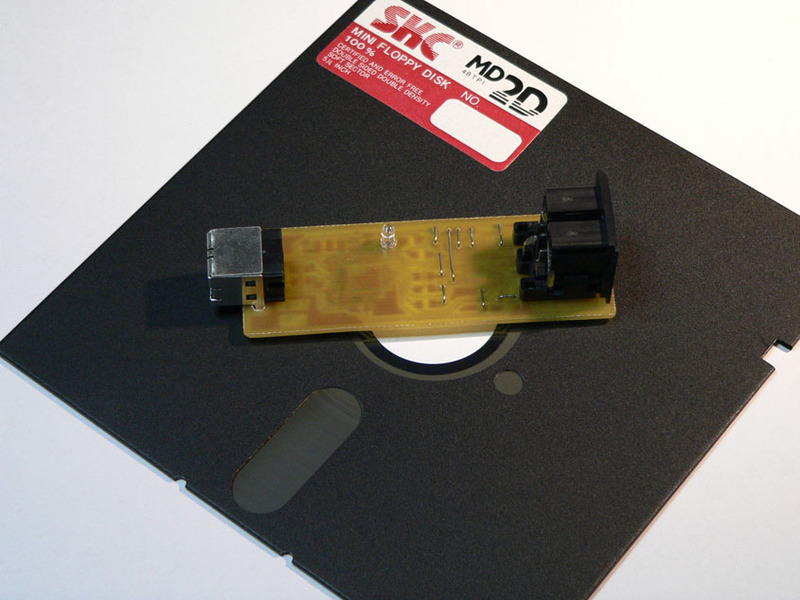 The mini xum1541 is a USB to Commodore IEC serial adaptor which allows you to connect a Commodore 1541 floppy to a modern PC. The design is based on the ZoomFloppy board and the xum1541 firmware provided by Nate Lawson which he has kindly made available under a GNU General Public License. The mini xum1541 is basically a pin-compatible copy of the ZoomFloppy board which has been stripped down to the bare minimum components required for serial IEC support. 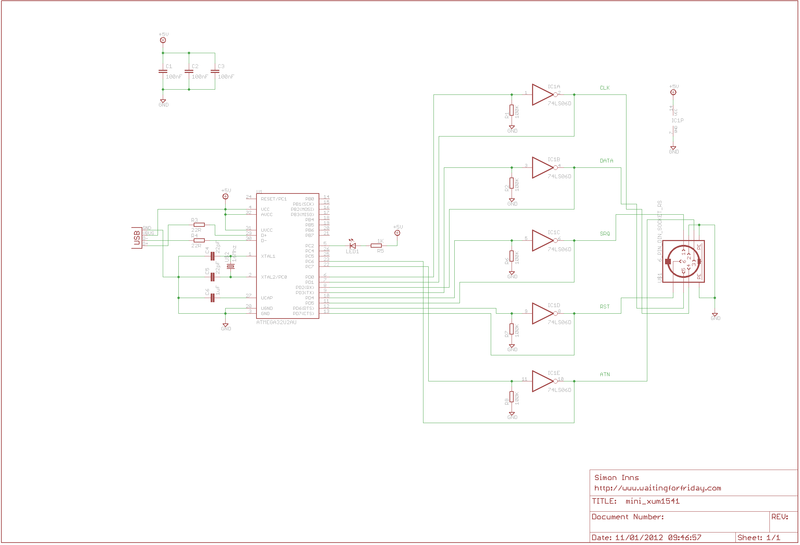 The PCB is designed to make hobbyist construction as simple as possible; it is single-sided with relatively large vias to allow soldering by hand. The tolerances of the PCB design are suitable for UV exposure transfer. 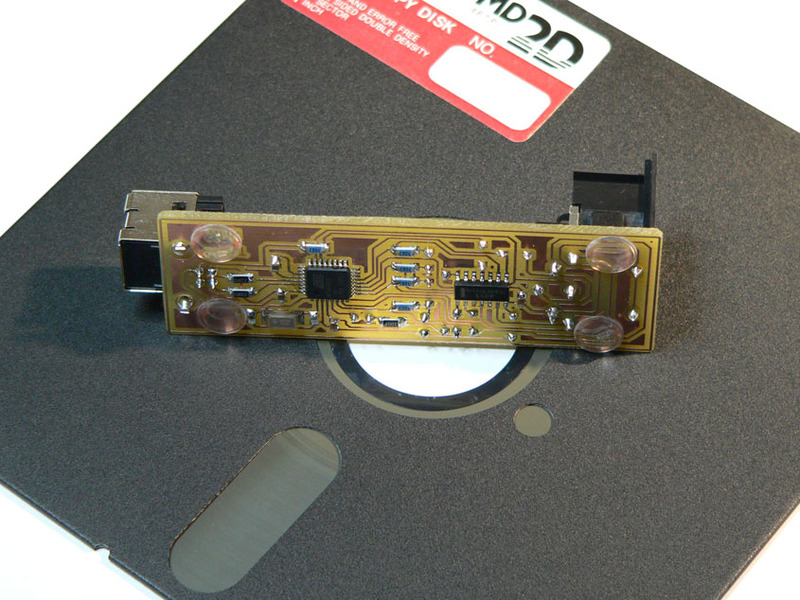 The ZoomFloppy is the product of several iterations of design based around AVR microcontrollers. The original version used a 3.3V AT90USBKEY development board which required resistors to lower the 5V input from the IEC bus. These resistors are also present on the ZoomFloppy board but are not necessary since the ZoomFloppy uses an ATmega32U2 running at 5Vs so they have been removed in the mini xum1541 design. The mini xum1541 is programmed using Atmel’s FLIP USB boot-loader code in exactly the same way as the ZoomFloppy (in fact you can use the manual and tools provided for ZoomFloppy to set up and program the device). No specific hex file for the mini xum1541 is required (the xum1541 and ZoomFloppy designs and code are available under the GPL so are freely available).